Ready for anything. Make sure your endless explorer is ready for summer squalls. Crafted of a critically seam-sealed waterproof fabric and lined with cozy fleece, this lightweight Columbia jacket will ensure he's ready for whatever Mother Nature has in store. Ready for anything. Make sure your endless explorer is ready for summer squalls. 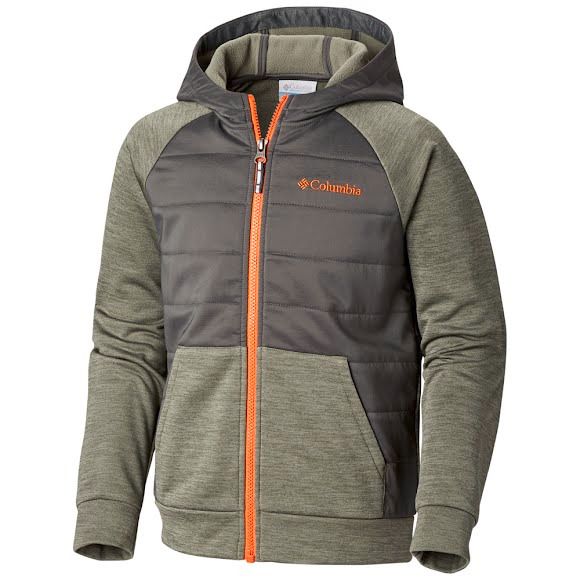 Crafted of a critically seam-sealed waterproof fabric and lined with cozy fleece, this lightweight Columbia jacket will ensure he&apos;s ready for whatever Mother Nature has in store. Adjustable storm hood, elastic cuffs, articulated elbows, and chin guard deliver added comfort and protection, while reflective details boost nighttime visibility.